Michigan Trails and Greenways Alliance is a 501(c)(3) nonprofit organization and the statewide voice for non-motorized trail users. 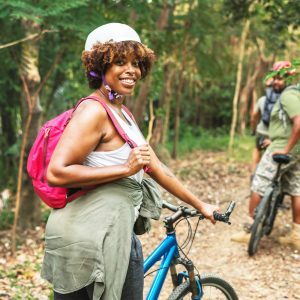 Its goal is to help people build, connect, and promote multi-use trails for a healthier and more prosperous Michigan. Trails are a valuable asset to communities looking to increase physical activity, to attract new residents, travel, and tourism, to promote a favorable business climate, and to provide residents with a healthy transportation choice that accents the community’s best features. We encourage you to use Michigan’s vast trail network for recreation, for your commute to work, to incorporate more fitness into your daily routine, and as an alternative transportation method to visit new places in a new way. We are here to ensure that Michigan remains the #1 trails state in the nation. Take a look around the Michigan Trails and Greenways Alliance website (links to new window) to learn about the work we do, how we are connecting Michigan from shore to shore through the Great Lake to Lake Trails system, how we can consult with your community to grow your trails, where to take a Pure Michigan trails vacation, and how you, too, can help ensure the future of Michigan’s trails systems.